Piaggio India will unveil a new range of Vespa scooters on September 1, in Mumbai. This will be done by the football legend, Alessandro Del Piero who spent almost a decade playing for Juventus. The company didn’t mention about the scooters that will be a part of this new range. But we believe it will be a heavy cosmetic update of the current models. Currently, Piaggio sells the Vespa LX 125, VX 125, S and the Elegante models in India. All these scooters are underpinned by the same platform and are powered by the 125cc engine that churns out 10bhp at 7500rpm and 10.6Nm at 6000rpm. Interestingly, the company had showcased the Vespa GTS300 at the India Bike Week 2015. 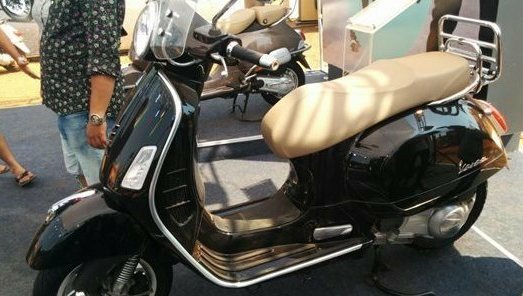 While showcasing a scooter isn’t really a launch confirmation, but there is a small chance of this scooter coming to India. The Vespa GTS 300 gets a 278cc four-stroke, single-cylinder, liquid-cooled fuel-injected mill that churns out 21.1bhp and 22.3Nm of torque. This powerful mill is mated to a CVT gearbox transmission. The GTS 300 rides on 12-inch wheels, both of which get a 220mm disc brake for good stopping power. It also gets a traction control system and ABS. If launched, the Vespa GTS 300 is surely going to cross the one lakh price mark. This scooter will act like a brand building product, rather than generating lot of sales. Stay tuned to BikeWale as we get you more information from the event.